This cute-as-a-button peach pie is from the Saturday Montgomery Farmers Market. 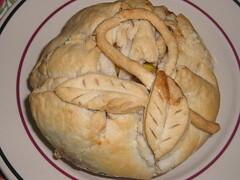 It’s made by Just Made Bakery, the on-site bakery at Tree-Licious Orchards. The Tree-Licious table of course has lovely peaches, plums, apricots, etc. this time of year, but it was the pie that caught my eye. And it’s not just good looks; it tastes great too because, wonder-of-wonders, those peaches are just lightly sweetened, so you really taste the fruit. When you go, be sure to check out their tiny red and yellow sugar plums, too. You’ll also find beautiful vegetables, flowers and more at the Market, so be sure to visit Saturdays between 9 am and 1 pm.